period. The evaluation consists of the ADOS and additional instruments as deemed necessary for the individual. The evaluation is conducted by an American Board Certified School Neuropsychologist and retired school psychologist. Assessments are not always necessary in order to plan for improvement in behavioral skills. With individuals who may have several deficits, however, assessments may be needed to help determine where to start with making a plan for learning new behaviors. In many cases, there are gaps in learning that may be causing problems. These gaps may be in social/play skills, daily living skills, communication skills, and/or academic skills. Assessments such the Assessment of Basic Language and Learning Skills—Revised; the Social Skills Checklist; the Assessment, Evaluation, and programming System for Infants and Children—Second Edition; the Verbal Behavior Milestones Assessment and Placement Program; and, Assessment of Functional Living Skills may be used. 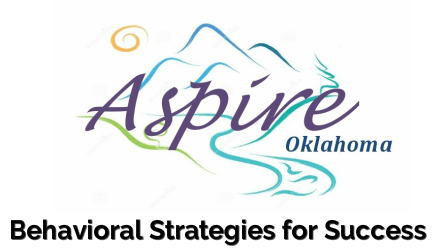 Aspire Oklahoma LLC is in the business of improving people’s lives. We are able to access all types of insurance that cover behavioral therapies, specifically TriCare and SoonerCare. We will investigate each client’s insurance coverage. Private pay clients are also welcome and we attempt to keep our fees at a reasonable level. A free consultation is conducted in order to develop the most cost effective plan for each individual needing our services. Fees for consultations, trainings, and group services are determined on a case-by-case basis. For more information concerning fees for service, contact us.